What the dumbest "house rule" you've heard of from a dealership? 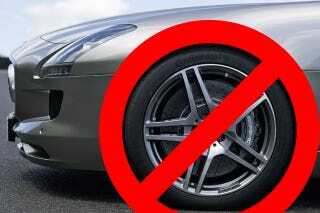 I was just told, by a dealership I've bought cars from, that they "don't mount tires that are purchased elsewhere". Not even if Michelin themselves sent you a set. During a open house at a local shop that specialized in classic BMWs, Mercedes, Porsche, etc I won a door prize for free set of Michelin tires in any size. Being the most expensive and "disposable" tires of any car I own, I got a set of Pilot SuperSports for the SLS. Now the original tires are finally worn out and I need to get the new ones mounted and balanced. So I call the closest MB dealer (they are usually the most careful not to mark/scuff a rim), MB of Knoxville and ask for an appointment to mount and balance...but they "don't mount tires that aren't purchased here." I explain that I didn't "buy" them anywhere and that I was a regular customer and patron of their service and parts department. "Sorry sir, you didn't buy them here so we can't help you." I'm tempted to try and get the BMW dealer next door to mount them out of spite. It's a small thing and it sounds a little extreme but it makes me never want to do business with them again. Anyone else run across dumb "rules" at dealerships? And many more I can't recall.